If any good has come of the global H1N1 flu pandemic, it may have started with a child like Nayeli Quispe, 7, a second-grader from the impoverished hillsides of La Paz, Bolivia. Prompted by a massive campaign by the country's public-health officials to contain the spread of the new flu virus, Nayeli and millions of other Bolivian schoolchildren have been washing their hands a lot more than usual  after recess, before meals and every time the animated dancing hands pop up in public-service announcements on TV. "First you wet them really well, then you rub the soap all around and then you dry them with a clean towel," says Nayeli. Public-health experts now say the increase in hand-washing across the country may have had some collateral benefits, not only in helping to reduce H1N1 infections, but also the spread of other common diseases in Bolivia. "We see a steady 10% to 15% drop in the rate of incidence of acute diarrheal diseases in all age groups, compared with last year's numbers at this time," says Dr. René Lenis, Bolivia's director of epidemiology, referring to data collected on the number of weekly cases of diarrheal disease reported in medical centers nationwide in 2008 and 2009. Although the new statistics, and the apparent link between hand-washing practices and disease reduction, need further investigation, "this certainly raises our attention," says Lenis. Diarrheal diseases are the biggest killer of children under age 5 worldwide; in Bolivia, 30,000 children die each year from such illnesses. 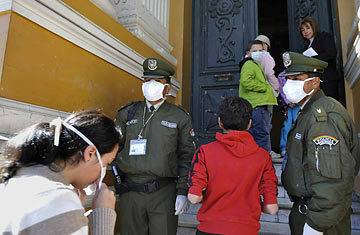 Swine flu, as H1N1 is still referred to there, has hit Bolivia hard as well, with more than 2,000 infections and 55 deaths in a country of 9 million, most having occurred during the southern hemisphere's winter (June through August). When the virus first appeared, say government officials, the country reacted the only way it could. "You can combat these outbreaks in two ways  medically and nonmedically," says Lenis. "Bolivia doesn't have the medical resources that other countries do, so we rely on prevention and educational campaigns." Starting in April, sudsy cartoon hands were everywhere, promoting hand-washing on billboards, at soccer games, in classrooms and on TV. "[Nayeli] was taught at school, and then would remind us to do it at home," says Claudia Quispe, Nayeli's mom. It's not that she and her family didn't wash their hands before, explains Quispe, an indigenous Aymara shop owner, but they didn't do it as much or as thoroughly as they should have. Within her family, Quispe thinks the public-health campaign has been a success: "Normally both Nayeli and my 3-year-old son have constant stomachaches or diarrhea. But in the last few months, they just haven't had those issues," she says. That's exactly how the program is supposed to work, says Therese Dooley, a senior adviser for UNICEF's Water, Sanitation and Hygiene (WASH) project. "Kids are the key because they are great at carrying messages," Dooley tells TIME. For years, WASH has been trying to educate people, particularly in developing countries, about the benefits of a simple action like washing hands with soap. Diligent washing, especially at critical times (like after going to the bathroom and before meals, for example), helps reduce the rate of diarrheal disease by more than 40%. Often, though, the problem is not just about good habits or bad ones but about access to clean water or the ability to afford soap. In Bolivia, 25% of the country still doesn't have access to water in the home. Health officials recognize that every citizen must have a sink to wash their hands in before they can expect significant reduction in disease. But when more than half the population is already living with some sort of bacterial or parasitic stomach infection, it's crucial to encourage those who can wash their hands to do so. Lenis and Dooley are still wary of the short-term data on Bolivia's descending rates of diarrheal disease; it remains to be seen whether the trend will hold up. But the findings "make a lot of sense, because behavior change like increased hand-washing happens quicker when there is a perceived threat," says Dooley. She says she has not seen similar data regarding a drop in rates of diarrheal or other diseases on an H1N1 timeline from other countries (though at least one news report suggests that increased hand-washing due to H1N1 has led to a sharp reduction of pinkeye cases in Korea). They may trickle in, however, if other countries are also looking for these correlations, says Dooley. Bolivia's challenge now is to maintain the good numbers. The last time Bolivia witnessed a plummet in diarrheal-disease rates was during the cholera outbreak of 1992 and 1993, when better personal-hygiene habits led to a reduction in the spread of infection. But as the threat of the disease died down, so too did people's standards of cleanliness. Lenis says that the Bolivian government is committed to continuing its media campaigns and that ongoing potable-water and sewage-system expansion projects will help make Bolivians healthier. Most important, however, is keeping up the education, says Lenis. "Adults forget or think [hand-washing is] not necessary anymore, but kids get into it as an activity," he says, adding that he's lobbying to make hand-washing education part of the basic public-school curriculum. It may thus be up to little Nayeli and all her friends to keep their country on track. The original version of this article misspelled the surname of UNICEF's Therese Dooley. Read "Side Effects of 1918 Flu Seen Decades Later." See how to prevent illness at any age.